I have received remuneration from Nutrisystem to promote the sweepstakes mention in this post. Nutrisystem, Inc. has been helping America lose weight for over 40 years. Through Nutrisystem’s comprehensive program, they’ve remained at the forefront of the weight loss industry, and became a publicly traded company in October of 1999 (NASDAQ: NTRI), the same year they launched their innovative website, www.nutrisystem.com. I've struggled with my weight for most of my life. I find that I, personally, do best when I have a very specific set of guidelines to follow when I am dieting. My choices aren't always the best, so with only good choices to choose from, it helps. How about you? Do you want to be healthier? 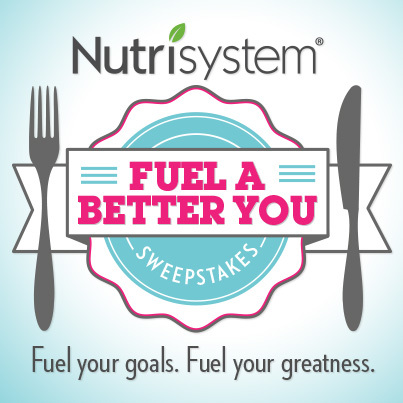 If you do, check out the new Nutrisystem Fuel A Better You Sweepstakes. Hosted on the Nutrisystem Facebook Page, you can enter to win some great prizes... all focused on fueling your goals and fueling your greatness. To enter the Nutrisystem Fuel A Better You Sweepstakes, just visit the sweepstakes tab on the Nutrisystem Facebook page, fill out the entry form and press the enter button to submit your entry! Fuel your goals. Fuel your greatness. Enter to win. Good luck!